Most everyone, including many conventional physicians, have begun to appreciate the importance and value of vitamin D. Few, however, recognize the importance of vitamin K2, which is nearly as important as vitamin D.
Dr. Dennis Goodman,1 who was born in South Africa and trained at the University of Cape Town, has multiple board certifications in cardiology (and several subspecialties) and holistic integrative medicine. After his internship at the Grootte Schuur Hospital—where Dr. Christian Barnard did the first heart transplant in 1967—he came to the US, where he did his cardiology fellowship at the at the Baylor College of Medicine in Houston, where Dr. Michael DeBakey performed the first bypass surgery. "I was really very lucky to be in a situation where I had these two cardiac giants as mentors and teachers," he says. Dr. Goodman is also the chairman of the Department of Integrative Medicine at the New York University (NYU), and has authored the book, Vitamin K2: The Missing Nutrient for Heart and Bone Health. In it, he explains why vitamin K2 is every bit as important as vitamin D.
“For 20 years I was putting stents in; running around day and night at the hospital. When I got called to the emergency room for someone having a heart attack, I was like a fireman putting out a fire in a house. Sometimes, you were very lucky and could save the house from burning down, and sometimes not. What I started to realize is that prevention is really the key for us to making the maximum impact. I’ve always been interested in the idea that everything we need to be healthy is provided by the Lord above –namely what’s out there for us to eat. 80 percent of these chronic diseases including atherosclerosis, heart attacks and strokes, diabetes, and obesity are preventable. So I got into the whole idea of learning integrative medicine,” he says. He was the chief of cardiology at Scripps Memorial, and went on to Scripps Clinic for Integrative Medicine for many years. As a cardiologist, it's quite appropriate to delve into vitamin K2, as it has two crucial functions: one is in cardiovascular health and the other is in bone restoration. It performs many other functions as well, but by helping remove calcium from the lining of the blood vessels, vitamin K2 helps prevent occlusions from atherosclerosis. Vitamins K1 and K2 are part of a family, but they are very different in their activity and function. Vitamin K1, found in green leafy vegetables, is a fat-soluble vitamin involved in the production of coagulation factors, which are critical for stopping bleeding. Apigenin is a polyphenol found in vegetables such as parsley and celery. It is receiving increased attention as a low-cost nutrient to protect against common cancers. What makes apigenin so fascinating is how it functions to starve cancer cells, promote cancer cell destruction, and protect cellular DNA against environmental toxins (that can result in future malignancies). Compounds such as indole-3-carbinol (I3C) are found in cruciferous vegetables. These cruciferous compounds have been shown to work in complementary ways with apigenin (non-cruciferous) to combat cancer and other age-related diseases. Vegetable extracts present in broccoli, celery, parsley, kale, Brussels sprouts, and many others—have long been revered for their health-promoting benefits. It is now recognized that four compounds, apigenin, I3C, DIM, and BITC, are responsible for the majority of that protection, and in very specific and complementary ways. All four have powerful cancer-protective effects, attacking and preventing malignancies through a multitude of overlapping mechanisms. Apigenin also has exceptional cardiovascular, metabolic, and neuroprotective properties, while I3C/DIM promote cardiovascular and liver health. Consumption of these plant compounds provides broad-spectrum protection against many of the most common symptoms of aging. Most 5-HTP also known as oxitriptan (INN)is extracted from the seeds of a woody climbing shrub native to West Africa, called the Griffonia simplicifolia plant. 5-HTP or "hydroxy L-tryptophan" (5-Hydroxytryptophan) is a naturally-occurring amino acid and is the precursor and metabolic intermediate in the biosynthesis of the neurotransmitters serotonin and melatonin from tryptophan. 5-HTP is converted to the neurotransmitter serotonin (5-HT), with the help of vitamin B6. This occurs both in nervous tissue and in the liver. 5-HTP crosses the blood-brain barrier (while 5-HT does not). Supplementation with 5-HTP therefore increases production of serotonin. Widely used to help with obesity (dieting), PMS, migraines, depression, anxiety, insomnia and addictive behaviour. 5 HTP increases production of serotonin. Serotonin levels in the nervous system are essential for so many aspects of our daily lives. Serotonin is responsible for feelings of well being, satisfaction and for normal sleep patterns. Obesity, PMS, migraines, depression, anxiety, insomnia and addictive behavior have all been associated with low levels of serotonin. Serotonin plays an important role in controlling anger, aggression, body temperature, mood, sleep, human sexuality, appetite, and metabolism, as well as stimulating vomiting. It is thought the hectic modern lifestyle of stress and bad eating habits lowers serotonin levels in the body. It is known that irritability, aggression, impatience, anxiety and worrying cause the body to release serotonin. This serotonin then needs to be replenished by the body from the food you eat. But serotonin is not found in large quantities in most diets so the body has to makes it itself from foods which contain L-tryptophan, such as chocolate, oats, bananas, dried dates, milk, yogurt, cottage cheese, meat, fish, turkey, chicken, sesame, chickpeas, and peanuts. Many people therefore crave the foods listed (fats and carbohydrates), especially when stressed, causing weight gain, depression, headaches, and muscle aches. Clinical studies have shown that supplementing with 5-HTP produces positive results in weight loss, anxiety and depression. It improves sleep patterns and reduces carbohydrate cravings in those on low carbohydrate diets (such as The Atkins Diet). Anyone using a weight loss program similar to the Atkins Diet could experience a reduction in serotonin levels due to the fact that carbohydrates stimulate serotonin production in the body. Serotonin release is triggered by a carbohydrate load (sugar etc.) and it is thought that's why we often crave Carbohydrates under stress as we want to stimulate this serotonin release. When the brain produces serotonin, tension is eased. Conversely when the brain produces dopamine or norepinephrine (noradrenaline), we tend to think and act more quickly and are generally more alert. Therefore eating carbohydrates seems to have a calming effect, while proteins increase alertness. Taking 5-HTP supplements can stop this craving for fats and carbohydrates, as well as providing the body with the means to control all those other functions listed above, such as anger, appetite and sleep. Some research has been done into 5-HTP and shows it has potential to help with depression and possibly anxiety, panic disorder, sleep disorders and obesity. 5-HTP seems to have the same effects as SSRI (Selective Serotonin Re-uptake Inhibitors) antidepressants. Prescription drugs that raise serotonin levels are prescribed for all of these problems, but many people believe 5-HTP is a natural way to accomplish the same thing. For improving sleep, it is widely recommended to take 5-HTP 30 mins before going to bed, as apart from producing Serotonin, 5-HTP also produces Melatonin, which is a sleep-inducing hormone. The usual dosage is either a 50mg or 100mg tablet. The effects of taking 5-HTP can be felt within 10 to 30 mins. Try to buy 5-HTP which also contains vitamin B6, as Vit B6 is needed for 5-HTP conversion into serotonin. 5-HTP is usually tolerated much better than traditional antidepressants. Excess 5-HTP is thought to be metabolized and excreted, especially when taken with Vitamin B6. Why not try some today and see if you too can reduce your cravings, stress and anger levels, as well as getting a good night's sleep! Getting enough magnesium may help keep blood pressure under control, a new meta-analysis of previous research finds. People in studies who took magnesium supplements had lower blood pressure after three months compared with people who did not take magnesium supplements, according to the analysis, published today (July 11) in the journal Hypertension. In their meta-analysis, the researchers looked at 34 studies totaling more than 2,000 patients. All of the studies were randomized, double-blind, placebo-controlled trials, meaning that some of the people in each study were given a placebo instead of magnesium, and neither the participants nor the researchers knew who received the placebo or the magnesium. The studies ranged in length from three weeks to six months, and participants took between 240 and 960 milligrams of magnesium each day during their studies. Botanical remedies have been used for centuries to treat various inflammatory conditions. Recent research has elucidated many mechanisms of action for such herbs, including modulation of cytokines, downregulation of NF-kB, and the inhibition of cyclooxygenase enzymes. It has also indentified active constituents and led the way to developments for enhancing the bioavailability and efficacy of these natural anti-inflammatory agents. This review describes some recent advances in our understanding of the actions and efficacy of 2 ancient anti-inflammatory herbs—turmeric (Curcuma longa) and frankincense (Boswellia serrata)—with modern examples of the evidence of their efficacy in osteoarthritis. Inflammatory conditions are common in clinical practice. Acute inflammation is a part of the complex biological response of vascular tissues to harmful stimuli, such as pathogens, damaged cells, or irritants. It is a protective attempt by the organism to remove the injurious stimuli and to initiate the healing process. Thus, inflammation is required for the healing of wounds and infection. In acute inflammation, a cascade of biochemical events propagates the inflammatory response, involving the local vascular system, immune system, and various cells within the injured tissue. Chronic inflammation leads to a progressive shift in the type of cells present at the site of inflammation and is uniquely characterized by a simultaneous destruction and healing of the tissue from the inflammatory process. Inflammation must therefore be controlled to ameliorate symptoms and prevent chronic inflammatory disease. Numerous inflammatory mediators have been identified as being critical in regulation of the inflammation response. The nuclear factor NF-kB is considered as to be a nearly archetypal pro-inflammatory pathway, because NF-kB is so decisive in its control of the expression of genes that lead to upregulation of cytokines (a proinflammatory event). NF-kB, unsurprisingly, is chronically active in many inflammatory diseases, such as inflammatory bowel disease, arthritis, sepsis, gastritis, asthma, among others. Omega-3 fatty acids are considered essential fatty acids. They are necessary for human health, but the body can't make them. You have to get them through food. Omega-3 fatty acids are found in fish, such as salmon, tuna, and halibut, other seafoods including algae and krill, some plants, and nut oils. Also known as polyunsaturated fatty acids (PUFAs), omega-3 fatty acids play a crucial role in brain function, as well as normal growth and development. They have also become popular because they may reduce the risk of heart disease. The American Heart Association (AHA) recommends eating fish (particularly fatty fish such as mackerel, lake trout, herring, sardines, albacore tuna, and salmon) at least 2 times a week. It is important to have the proper ratio of omega-3 and omega-6 (another essential fatty acid) in the diet. Omega-3 fatty acids help reduce inflammation, and most omega-6 fatty acids tend to promote inflammation. The typical American diet contains 14 to 25 times more omega-6 fatty acids than omega-3 fatty acids, which many nutritionally-oriented physicians consider to be way too high on the omega-6 side. Indeed, studies suggest that higher dietary omega-6 to omega-3 ratios appear to be associated with worsening inflammation over time and a higher risk of death among hemodialysis patients. The Mediterranean diet, on the other hand, has a healthier balance between omega-3 and omega-6 fatty acids. Many studies have shown that people who follow this diet are less likely to develop heart disease. The Mediterranean diet emphasizes foods that are rich in omega-3 fatty acids, including whole grains, fresh fruits and vegetables, fish, olive oil, garlic, and moderate wine consumption. BACKGROUND: Nutrients work as a team, and some nutrients work very closely together. 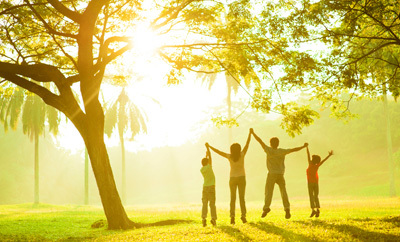 Coenzyme Q10 (CoQ10), carnitine, and alpha-lipoic acid are a great example. They function in related biochemical pathways toward the same result: breaking down food molecules to create energy. This energy, in the form of adenosine triphosphate (ATP), acts as a biological battery that drives all cell activities. DETAILS: The ultimate breakdown of food to create ATP occurs in tiny cell structures called mitochondria. Two chemical processes within mitochondria—biochemists call them the Krebs cycle and oxidative phosphorylation— govern most of the energy-producing chemical reactions. It’s in these processes that CoQ10, carnitine, and alpha-lipoic acid do their jobs. BIG-PICTURE IMPLICATIONS: ATP provides the oomph to make things happen, from moving immune cells to fight infections to making your muscles flex. Researchers gained a fundamental perspective of these processes when they discovered that a group of inherited diseases, called mitochondrial myopathies, were caused by defects in the body’s ability to make energy. Subsequently, researchers discovered that CoQ10, carnitine, and alpha-lipoic acid could improve energy levels in people with these myopathies. Studies have also found that people with chronic fatigue syndrome (CFS) and more generalized fatigue can benefit from these supplements. Many scientists now believe that the aging process begins with a deterioration of mitochondrial activity—and tantalizing research suggests that these and other nutrients can slow the aging process. Carnitine. This vitamin-like nutrient helps transport fats into mitochondria, where they are burned for energy. In a study of 66 centenarians, doctors found that taking 2 grams of carnitine daily led to significant improvement in physical and mental fatigue, greater muscle mass, and sharper thinking. Taking CoQ10 supplements can help boost collagen and elastin production, which helps protect skin from aging. Alpha-lipoic acid. This antioxidant plays multiple roles as a cofactor in the energy-generating Krebs cycle. 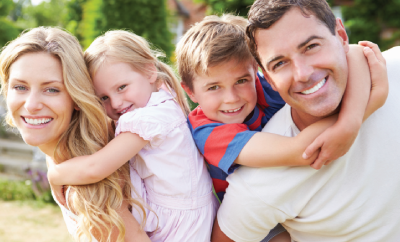 A patient case history described by European doctors illustrates its benefits: As a child, the patient had been thin, weak, and exercise intolerant. By her early 20s, she had developed eye-muscle disorders and droopy eyelids. When examined in her early 30s, she had very weak arm and leg muscles. Tests found that she was producing low levels of ATP. So the doctors gave her 200 milligrams of alpha-lipoic acid three times daily. After several months, tests indicated that her ATP production had increased substantially and her overall energy levels had improved as well. CoQ10. This vitamin-like nutrient helps shuttle around energy-carrying electrons to maximize ATP production. Supplements can boost energy levels and enhance stamina. In one study, Japanese researchers reported that people were able to bicycle faster and had quicker recovery times after just one week of taking 300 milligrams of CoQ10 daily. ACCESSORY NUTRIENTS: Carnitine is available in several forms, including L-carnitine and acetyl-L-carnitine. Vitamin C is needed for the body to make its own carnitine. Energy production can also be enhanced with vitamins B1, B2, and B3, magnesium, ribose, and creatine monohydrate. THE SYNERGISTIC PAYOFF: Some cardiologists have used CoQ10 to help patients recover from cardiomyopathy and heart failure. Studies have found that acetyl-L-carnitine and alpha-lipoic acid together can boost energy and mental function. For improving energy levels, combining lipoic acid with L-carnitine (or acetyl-L-carnitine), and CoQ10 is an ideal approach. WHAT YOU SHOULD TAKE: Take approximately 100 milligrams of CoQ10, 1,000 milligrams of carnitine, and 200 milligrams of alpha-lipoic acid daily to boost energy. For more serious health problems, such as heart failure, consider taking 200 milligrams of CoQ10, 2,000 milligrams of carnitine, and 400 milligrams of alpha-lipoic acid daily—but please work with your physician. Cellular Oxygen "The Key to Better Health"
The human body can live days without water, weeks without food, but only minutes without oxygen. The reason stems from how vital each of these factors are to the cells of our body which keep us alive. The most important factor vital to good health is oxygen. This should mean that if we were to increase oxygen to certain people we should see health benefits. Well, that's exactly what happens in these next two examples. The first example is football players who are exposed to some of the most extreme physical conditions, i.e. playing in the heat, snow, with heavy protective gear, enduring tackles, etc... What do they do when they go to the sideline exhausted from exertion? They take in oxygen. Why? Because the oxygen will help them to get rid of lactic acid and recharge their cells. Boosting oxygen to the body for temporary periods will increase physical performance and endurance while decreasing fatigue. The reason is that oxygen acts as an anti-inflammatory within the tissues (blood vessels, muscles, joints) and it also is crucial to the proper cellular functioning of the creation of energy within the cell. The next example of the health benefit of oxygen is its importance in surviving life or death situations. Oxygen is one of the first things paramedics will give a person in a state of life or death. Oxygen is present in every ambulance in most of the world for a reason, and many EMTs and paramedics can tell you about the life saving effects of it. So these are some extreme examples, but what about everyday people and everyday situations. The most commonly encountered problem many of us face daily is stress. Financial pressures, health issues, traffic, air pollution, noise pollution, bombardment of negative information from the media, etc. The cumulative effect of chronic stress on the body can be devastating leading to diseases such as hypertension, ulcers, chronic fatigue syndrome, fibromyalgia, headaches, IBS, depression, anxiety, heart disease, kidney failure, chronic uncontrolled systemic inflammation, etc. Stress over stimulates our sympathetic nervous system. This is the part of our nervous system known as the "fight or flight system" designed to put our bodies in survival mode preparivng us for dangerous situations. This part of our nervous system will constrict peripheral blood vessels, increase heart rate and raise blood pressure. Stress reactions happen in the body frequently when the body encounters noxious stimuli such as pain, danger, anger, loss, fear etc... While this survival mechanism is very important to us momentarily it’s not meant to occur for prolonged periods of time. When this does happen for prolonged periods of time it will have deleterious effects on health. Over stressing the sympathetic nervous system will cause the body to eventually crash as the cells use up all of their energy and are no longer able to recreate more energy. Because the body is in a stressed state it will favor using anaerobic metabolic pathways in the creation of energy. As a result of this, the tissues of the body will build up metabolic acidic wastes (lactic acid) and become inflamed. When the system finally crashes to correct itself, the person will feel drained, feeling burnt out is a good descriptor for this. This decreased energy state within the body leaves it vulnerable to attack from pathogens such as viruses and bacteria because the immune system has less energy to fight disease. Some Basics of Metabolism - Cellular Respiration creates ATP. Cellular work requires ATP. Do not use oxygen= anaerobic respiration (without oxygen). The main concept to understand in this somewhat complex process is that with oxygen, aerobic respiration produces +30 ATP per glucose molecule while without oxygen anaerobic respiration produces just 2 ATP. You can probably figure out then that it is better for the cell to metabolize energy aerobically with oxygen to get more ATP in the cell than without oxygen. More ATP in the cell means more energy for the cell to do all the work required to sustain our bodies in a healthy state. Less ATP means the cells would have less energy to do the same work making it more difficult and probably not allowing the cells to carry out all the necessary reactions for good health. How this relates to oxygen is that Dr. Manfred Von Ardenne, a pioneer in medical oxygen research, discovered that when the body is dealing with a noxious stimuli such as stress, disease, pain etc., the effect in the microvasculature (capillaries, arterioles and venules) would be a choking off of the capillary. The capillary is the major route of transport of oxygen and waste removal for the body’s tissues. After careful research he discovered this was due to the endothelial cells (which line the inside of the entire vascular system) losing energy by the processing of energy anaerobically. The effect within the cell from the energy loss would create a swelling of the endothelial cell wall. The effect on the microcirculation would be a decrease of oxygen delivery to the tissues, a decrease of clearance of metabolic wastes (lactic acid) and a decrease in the body’s ability to fight infections in the tissues due to decreased capillary access. An easier way to understand this is that cells that can't breathe, can't be healthy. This is an important concept to understand in health. When people get to the point they feel burnt out from overwork, not enough sleep, poor diet, stress, living with a disease etc., they are in a state of functional oxygen deficiency. If you are suffering from a chronic disease how did you get it in the first place? Most chronic diseases have in common endothelial dysfunction and therefore functional oxygen deficiency. This is not to say that functional oxygen deficiency is the cause of the disease but it may be associated with the disease you may be suffering from. There is not enough oxygen getting to the cells due to the possibility of poor transport such as in endothelial dysfunction which is common in most chronic diseases. There is underutilization of oxygen in the tissues due to mitochondrial enzyme deficiencies. The cells are using and require more oxygen than is being delivered at that time creating a shortage of oxygen in the cell. A good example of functional oxygen deficiency is an athlete who is pushing himself and using up all of his oxygen and ATP. This forces his cells into prolonged periods of anaerobic respiration creating a lactic acid build up with subsequent muscle soreness and fatigue. This is also a good example for people dealing with stress. Pushing themselves and over stimulating their sympathetic nervous systems will slowly begin choking off oxygen to their tissues and organs as they begin to favor anaerobic metabolism. They will also experience the effects of inflammation in their tissues as the lactic acid and wastes build up. This can begin to have bad effects on their health such as increased blood pressure, worsening circulation, digestive problems etc. An easy solution to correcting functional oxygen deficiency is through use of the EWOT procedure. Increasing oxygen to the cells while the body performs aerobic exercise will increase aerobic cellular respiration creating more ATP within the cell favoring an aerobic metabolic state. An aerobic favored metabolic state is associated with more energy, vitality, and health. This is the necessary energy state within the cell for good health (optimum cellular functioning). Additionally using the EWOT improves the removal of acidic waste (lactic acid) from tissues through re--enlarged capillaries and de-acidifies the body. EWOT alkalizes the body and raises blood PH through oxygenation. EWOT will improve functional respiration meaning the cardiorespiratory system along with the musculoskeletal system, bones, joints, muscles and all the organs needed to perform sustained movement i.e. brain, cerebellum. Unlike other oxygenation systems ozone or hyperbarics, EWOT forces the body to use the additional oxygen to create work in the body, using the ATP to drive the heart, lungs, muscles etc. The increased oxygenation can then get deeper into tissues and organs that may have been shut down for years due to poor health and or disease related endothelial dysfunction. The process will enable healing and restoration of health. In today's day and age, it's hard to avoid the causes of inflammation. With so much interconectedness we get too much information too fast and this can stress out our nervous system and cause immune weakening by burning us out. When you start getting beat up and start noticing symptoms such as pain, aches, digestive issues or problems sleeping or concentrating it may be a good time to think about seeing a provider for a health consultation. Many people think of going to the doctor and getting pills or shots which can be very important depending on your condition. However there are also natural options like vitamin and nutrient supplementation as well as therapeutic treatments which will work if you have some patience and interest in your body and healing. Many times when you have a problem, it's your bodies way of trying to get your attention to slow down or take better care of yourself. The usual culprit is too much inflammation that can be caused by physical wear and tear, poor dietary choices, or too much stress and not enough rest. Here at Healthways, we try to make health care fun, interesting, full of options and useful so you never feel like it was a waste of your time and money. At Healthways we think you are worth it and want to help you get it right so you can continue being well and stay out of the hospital. To investigate the effect on pain reduction and strengthening of the whole body vibration (WBV) in chronic knee osteoarthritis (OA). Patients were randomly divided into two groups: the study group (WBV with home based exercise) and control group (home based exercise only). They performed exercise and training for 8 weeks. Eleven patients in each group completed the study. Pain intensity was measured with the Numeric Rating Scale (NRS), functional scales were measured with Korean Western Ontario McMaster score (KWOMAC) and Lysholm Scoring Scale (LSS), quadriceps strength was measured with isokinetic torque and isometric torque and dynamic balance was measured with the Biodex Stability System. These measurements were performed before training, at 1 month after training and at 2 months after training. Cold laser or low level laser therapy came into being in 1960's. In 1967, Endre Mester, noticed that applying laser light to the backs of shaven mice could induce the shaved hair to grow back more quickly than in unshaved mice. 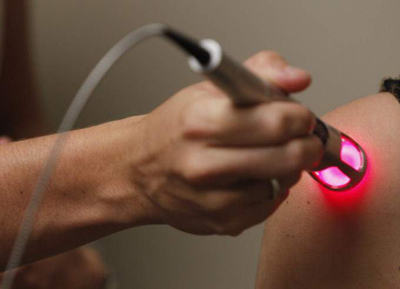 He also demonstrated that laser could stimulate wound healing in mice. Mester soon applied his findings to human patients, using lasers to treat patients with nonhealing skin ulcers. Cold laser has now developed into a therapeutic procedure that is used in three main ways: to reduce inflammation, edema, and chronic joint disorders; to promote healing of wounds, deeper tissues, and nerves; and to treat neurological disorders and pain. Cold laser involves exposing cells or tissue to low levels of red and near infrared (NIR) light, and is referred to as “low level” because the energy used does not cause enough heat to cut or damage body tissues. The VMO muscle known as the Vastus Medialis Oblique is an important muscle in understanding knee pain. The function of this muscle is to perform knee extension as well as allow for correct tracking of the patella (knee cap) over the femur. Many people with knee pain have a weakness in this muscle. The problem can be worse with females or anyone with wider hips which cause the patella to pull to the outside more that somone with thin hips. One of the reasons people can develop knee pain is because the body tends to favor a more lateral tracking due to the larger quadriceps muscles of the outer thigh. Unless a person develops the VMO muscle it may be weaker than the outer thigh muscles which are more easily developed with normal daily activities. This issue can become more of a problem with overuse due to excessive running, hiking etc... Developing the VMO can be achieved with a number of different exercises one of the easiest being doing knee extensions with the foot rotated to the outside to stress the VMO muscle. Kicking your leg out in front of you with the foot turned outward will also exercise the VMO muscle. If you are having any knee problems be sure to contact our office and schedule a consultation with one of our providers to learn more about how we can help. Loss of cervical and lumbar lordosis or normal posture is well known to be implicated in the progression of degenerative arthritic diseases of the spine. When normal lordosis and curvatures of the spine are lost, the normal biomechanical forces of weight distribution of body weight which are normally distributed through an arc are transmitted through a straightened spine causing additional compressive and shear forces on the lower cervical and lumbar spine. This in turn increases wear and tear and progresses early degeneration such as bone spurs, disc inflammation and increased chance of disc bulges and herniations. Restoring and maintaining the normal cervical and lumbar lordosis is a primary goal for a healthy spine. 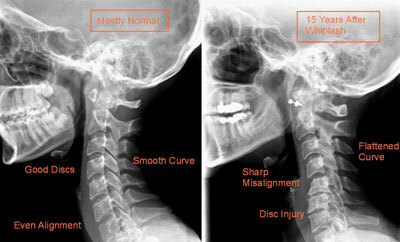 This can be achieved with correct stretching, exercise, physical therapy and chiropractic treatment program. Much of degenerative cervical and lumbar disc diseases can be prevented, avoided and/or minimized understanding this principle and utilizing the proper approach. Learn more about this with one of our providers here at Healthways Medical Group. Within manual therapy, Strain-Counterstrain is a type of "passive positional release" created in the early 1960s by Lawrence Jones, D.O. It is a hands-on treatment that alleviates muscle and connective tissue tightness by the use of very specific treatment positions held for 90 seconds (can be held for up to 3 minutes in neurological patients). During the procedure, the involved tissue is "slackened" causing a relaxation of the "spasm" which, in turn, allows local areas of inflammation, trapped within the painful tissue to dissipate. Following this "release" there is an immediate reduction of pain and tension in the involved tissue. This relaxation helps restore normal joint mobility and is also beneficial to other structures in the region that may have been compressed. This gentle and painless technique is a very effective treatment for a wide variety of orthopedic conditions such as headaches, fibromyalgia, sciatica, tendinitis, chronic neck pain, and post-surgical conditions. 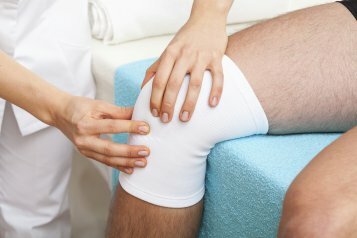 Our Healthways Medical Group Physical Therapist is knowledgable and experienced in this technique. Please call for a consultation if you are interested in it.